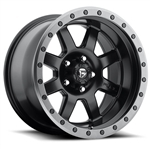 The FUEL Trophy is a clean 8-spoke wheel that is available in Matte Black finish with an Anthracite ring. The WILDPEAK A/T reinvigorates the all-performance sport utility and light truck tire market through its aggressive stance for maximum traction. A symmetric five-rib pattern and rigid block design allows for ultra durability, exceptional on-road response and optimized off-road handling.